The National Transportation Safety Board (NTSB) Monday, July 31, issued a Safety Alert warning rail workers of the risks of working on the tracks using only a watchman/lookout to provide the train approach warning. 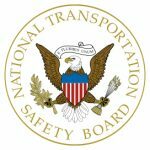 Safety Alert 066 was prompted in part by the deaths of two rail workers who were struck and killed by a train in Edgemont, South Dakota, Jan. 17, 2017. The NTSB investigation found the sight distance used by the watchman/lookout was about half the distance required by federal regulations. The Federal Railroad Administration (FRA) requires that workers be able to clear the tracks at least 15 seconds before a train moving at the maximum authorized speed can pass the work location safely. Click here to read Safety Alert 066: Watchman/Lookout: Your coworkers depend on you.